North Tawton Book Celebrating an Ancient Market Town is part of the Halsgrove series of parish books; first published November 2002 and reprinted October 2011. 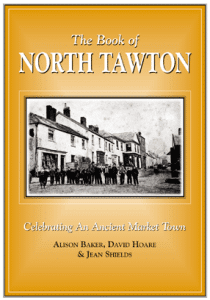 The history of the community of North Tawton as written and compiled by members of the community; Alison Baker, David Hoare, and local historian Dr. Jean Shields BEM. The Book of North Tawton is A4 size, hardback, 160-pages; and contains over 250 historic photographs, maps, drawings and illustrations. North Tawton is a small town located right in the heart of the Devonshire countryside. Situated alongside the River Taw from which it takes its name, it is arguably the smallest town in the county. Dartmoor, only a few miles away, provides a dramatic backdrop to an ancient settlement whose history began before the Romans established a fortification and continued through the heyday of the wool trade to which North Tawton owes its early prosperity. Available from North Tawton Post Office.